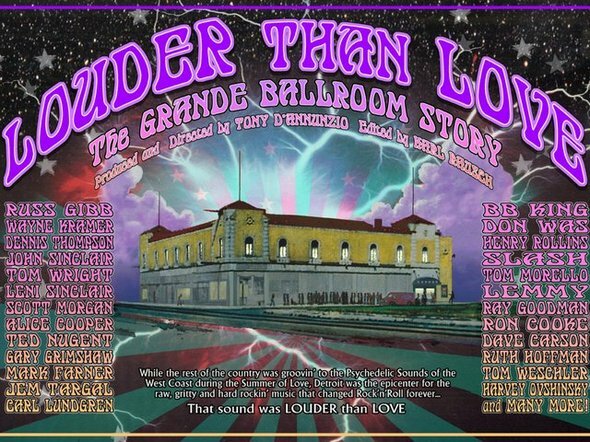 Posted on Sun, Apr 8, 2012 : 3:01 p.m.
"Louder Than Love -The Grande Ballroom Story" will be shown Monday at the Michigan Theater as part of radio host Martin Bandyke's "Moving Pictures" series. "Martin Bandyke's Moving Pictures" series continues at the Michigan Theater on Monday. 7 p.m. This week, see "Louder Than Love." During the late '60s the Grande Ballroom in Detroit stood as the epicenter of the Detroit rock music scene that spawned bands such as Iggy & The Stooges, Alice Cooper and many more. See rare archival footage and interviews by surviving musicians. $10/ general admission; $8/ students, seniors and children under 12. The Michigan is at 603 E. Liberty St., Ann Arbor. 734-668-8397. The Ravens Club will hold another cocktail class, "No Shots Allowed: Tequila Cocktails" on Monday. 7:30 p.m. In this class, you'll examine the role this underappreciated spirit plays in cocktails. Its sultry, smoky and sophisticated cousin Mezcal will also make an appearance. Classes are hands on, with lots of tasting opportunities. $35 in advance, $45 at the door. Ravens is at 207 S. Main St., Ann Arbor. 734-214-0400. There will be an "Empty Bowls" benefit at Frenchie's in Ypsilanti's Depot Town on Wednesday. 5-8 p.m. Donate at least $10 to enjoy a warm soup dinner, receive a handcrafted bowl and support your community. All proceeds will be donated to the SOS Food Pantry, which helps homeless families in Washtenaw County. Frenchie's is at 54 E. Cross St., Ypsilanti. 734-483-1035. SOLD OUT The "Third Michigan 'The Moth' GrandSLAM" will be held at the Ark on Wednesday. 8 to 10 p.m. Doors open at 7 p.m. Hosted by bestselling author and Moth podcast host Dan Kennedy, 10 champion Moth StorySLAM raconteurs will spin five-minute true tales on the theme “Fight or Flight.” Tickets are $16, and are now on sale at themoth.org. The Ark is at 316 S. Main St., Ann Arbor. 734-761-1800. Come to the "WCC Earth Day Event" on the second floor of the Student Center on Thursday. 10 a.m.-2 p.m. There will be a special raptor presentation from 11:00 a.m.-noon by the Leslie Science Center. Environmentalists, recycling enthusiasts and sustainability experts are just some of the people who will be on hand. Free. WCC is at 4800 E. Huron River Dr., Ann Arbor. Judah Friedlander from NBC's "30 Rock" will play a special engagement at the Ann Arbor Comedy Showcase on Thursday. 8 p.m. On "30 Rock," he's the trucker hat-sporting writer. In his stand-up act, Judah is the World Champion. He's a great athlete, master of the martial arts, gets tons of chicks & is a role model to children. And he's better than you at everything. $18 in advance; $20 at the door. The AACS is at 314 E. Liberty St., Ann Arbor. 734-996-9080. The Storytelling show at the Ark (The Moth) is sold out. Mon, Apr 9, 2012 : 6:46 p.m.
Good to know, I'll update it. Thank you.